Faculty classifications provide a basis for classifying faculty members into useful categories within FACULTY180. They enable tracking of faculty characteristics, such as faculty rank, tenure status, and employment status (full time or part time). They are also used in reporting for filtering and selecting particular groups of faculty. Setting up faculty classifications is a critical step in preparing for accreditation reporting. Click Faculty Classifications in the Customize section. The Faculty Classifications screen displays. Click Add. The Faculty Classifications Formscreen displays. Specify the settings for the new faculty classification. When you are finished, save the information. 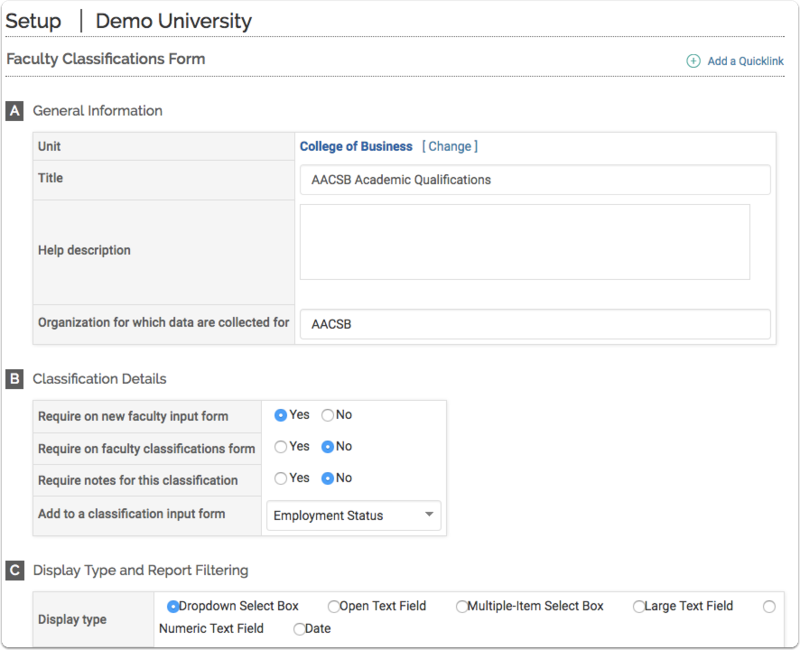 Once faculty classifications have been created, faculty classification data can be added and managed via bulk uploads (see Upload Base Data) or by manual input using the Create Input Form and Input Classifications options in the Administration section. Input forms are used by administrators to input faculty classifications and collect data from faculty. In addition, these input forms can be distributed and faculty classifications can be updated as part of the systems evaluation process. 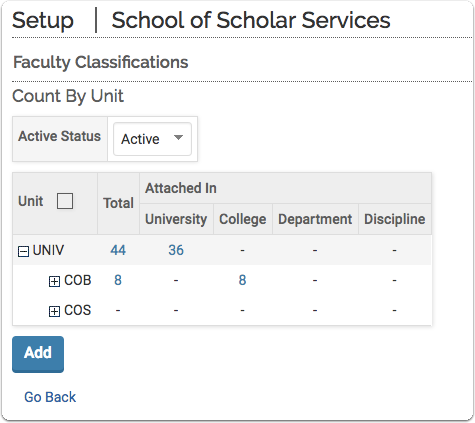 Click Faculty Classifications in the Customize section.The Faculty Classifications screen displays. Click the unit associated with the faculty classifications to be changed. The Manage Faculty Classifications screen displays. Click the Edit icon adjacent to the faculty classification to be changed.The Faculty Classifications Form screen displays.